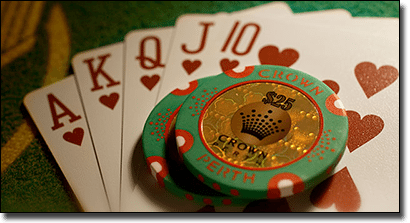 Crown Perth, formerly known as Burswood Casino, is the only licensed casino in Western Australia. Established in 1985 Crown Perth has been offering pokies, bingo and table games to the punters of Western Australia for 30 years. Crown bought a majority control of Burswood Casino in 2004 and have gone to great lengths and invested heavily in the complex to get it up to the Crown standard of quality, building a six star hotel. In 2012 the entire Burswood complex was re-branded as Crown Perth. Crown Perth is the second established Australian casino/hotel Crown owns, with another Sydney development under way. 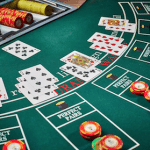 With 64 tables offering blackjack and its derivatives in Crown Perth, let’s have a look at what blackjack games are actually on offer. With a house edge of just 0.56%, this is the game in the casino to play. Crown Blackjack is mostly dealt from a shuffling machine loaded with eight decks of 52 cards. Blackjack is paid at 6/5, which is a little stingy in comparison to most Australian bricks and mortar casinos. Another odd rule for Crown’s normal Blackjack is the fact the dealer hits on soft 17’s at Crown Perth. This rule is usually reserved for Pontoon derivatives at most other bricks and mortar casinos in Australia. Doubling is allowed on any two card total of nine, 10 or 11. Splitting is allowed when the first two cards of your initial deal are identical in value. Each split hand can be doubled and re-split once if the cards allow for it. No hole card for the house. Blackjack Plus is very similar to blackjack, except for several seemingly player-friendly rule changes. Natural blackjack and all 21 hands are paid immediately, and payouts are set at the traditional 3:2 odds instead of the feeble 6:5 odds offered on Crown Blackjack. All five card hands under 21 are paid out immediately, too. Unlike Crown Blackjack, Blackjack Plus dictates dealers stand on soft 17 instead of hitting on soft 17, which is beneficial to the punter. The player can also double down on any two card total, not just nine, 10 or 11. So why do we suggest you avoid playing it? The one rule which counteracts all these seemingly punter-friendly rules is the fact the dealer does not bust on 22. If the dealer deals themselves a total of 22, they do not bust; all remaining hands on the table instead are considered to be a stand-off. This abomination of a game and it’s bizarre rule blows the house edge out to a whopping 2.86%, which is incredibly high for a blackjack game or derivative. As such, we recommend avoiding it. Tipping isn’t expected in Australian casinos, but many players do choose to tip the dealer. If you’re not sure about tipping etiquette during a game of blackjack, read our guide to when to tip the dealer. If you are playing from outside of Australia, you have the option of playing blackjack online instead. Online gambling is illegal in Australia as of September 2017 following the introduction of the Interactive Gambling Amendment Bill 2016, so for Australians the content below page is informational in nature only. Given the fact Crown Perth, Western Australia’s only legal bricks and mortar casino, offers a game which only offers a 6:5 payout on blackjack and hits on soft 17 or another game where the dealer doesn’t bust on 22, you are far better off playing 21 online to side step these weird rules. International layers can log on to one of our top-rated online casinos and choose from a dizzying number of blackjack games and derivatives. Microgaming offers Vegas Single Deck Blackjack with a house edge of 0.31%. In fact, there isn’t a Microgaming blackjack game with a house edge larger than 0.53%. 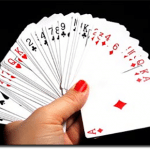 Looking to play blackjack with the best odds and payouts? Register an account online at www.RoyalVegasCasino.com, make an initial deposit and receive up to $1200 in matched deposit bonuses to kick start your playing money.